Shoei VFX-W: Not going to say much on it because its a full face off road helmet not very comfortable on the highway or in the cold (but it was my first one so I'll throw it up here for common ground sake). Amazing in the dirt, breaths great, light, durable, has emergency release cheek pads and fits my head great. I have a med oval to oval head shape. That's all I'll say about that one. Shoei RF-1100: This has been my first street helmet, and it ruins you if its your first helmet. There is not much more you can go up from here. The side to side FoV is great compared my buddies helmets (Bilt...dear god please do not buy one and O'neal for the dirt) The venting is better than average, and the exhaust vents keep the head cool. The helmet has a tendency to fog up in colder weather, but the chin vent solves that while moving. Talking about colder weather; the chin spoiler that comes with it makes it nice to about 45-50 F below that it breaths too much. The finish is durable and seems like it will last. I've had this helmet for a year and use it at least four times a week. lastly the weight is low compared to others I've seen and tried on. (I have not tried Arai) Changing the shield is also very easy. The price for graphics can be steep, but if you get a solid its well worth the investment. AGV GP-Tech: Picked one up today and only have 10mi on it. I'll post more about it as I ride in it but all I have to say is that this thing is LIGHT and no drag during head checks! 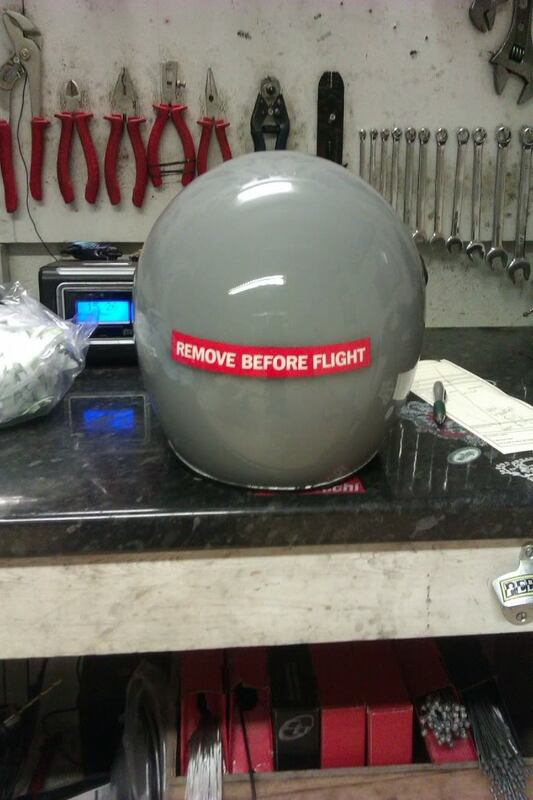 So one day on this helmet now in 100F weather and I have to say sadly it will not be my daily lid. The air flow in my more upright riding position is less than desirable. When in a tuck it flows great but when in a tuck you don't have the ability to see far enough in front of you... All I wish was for better upright air flow. That's it for me right now, lets here from you! Last edited by KCCO; 06-07-2013 at 09:41 PM. 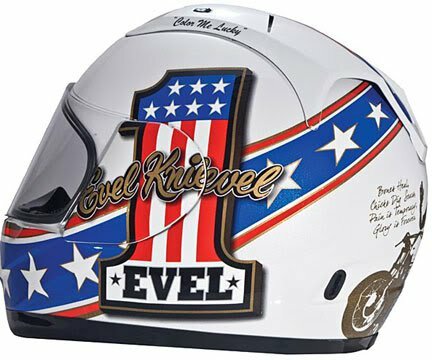 Rockhard Evel Knievel model. Colors matched my 85 Interceptor perfectly. Coolest helmet ever made, fits great too. Last edited by VtrInMtl; 06-07-2013 at 04:18 AM. Shoei RF-1100: This has been my first street helmet, and it ruins you if its your first helmet. There is not much more you can go up from here. I've had various Shoei helmets over the years. They fit me well so I've stuck with them. My current is the RF-1000. If I have 1 complaint it is noise. The RF didn't seem any quieter than the TZR it replaced. 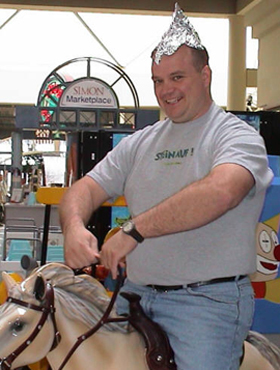 tinfoil. Heavy duty and double layered so the new drones can't get through either. Oh that and a Shoei rf900, plain white, covered in bugs. Glad you ask - about a month ago I purchased a Scorpion EXO 750 on closeout from Revzilla ($136) plus a tinted screen ($55) - the best $190 bucks I ever spent. 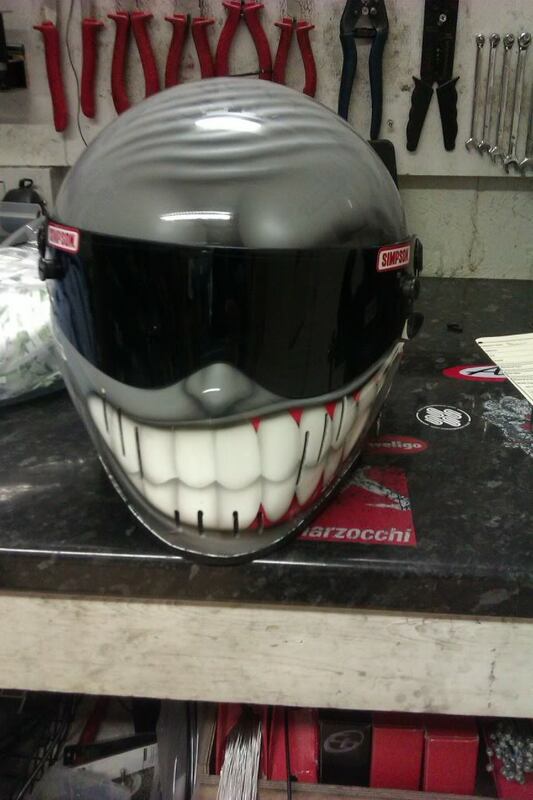 Its even got the air pump cheek pads, a little loud over 100 mph but what helmet isnt?? HJC RPS-10 is the current lid... There are high end Shoei's, Arai's and an AGV or two on the shelfs.. The light weight of the RPS-10, GREAT venting (better than any other helmet I own) and removable liner and pads for washing makes it a winner for me. 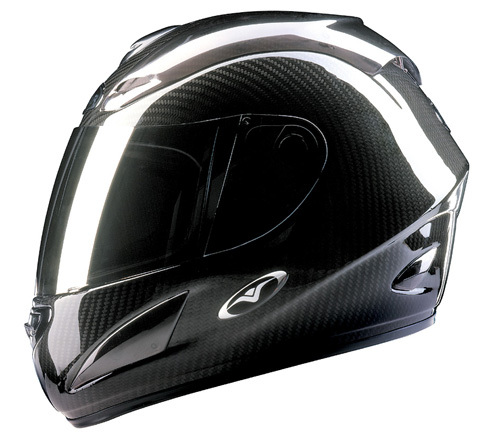 Arai Profile in aluminum silver. The only helmet that fit my long oval skull. Ordered a mirrored shield with it, removed all the lettering on it and now it looks like the head on Gort from the original movie The Day The Earth Stood Still. There is a learning curve on shield removal and replacement. Really feels like something is going to break while doing a shield swap. I've got it down now after a couple of years! This was the biggest complaint about Arai in the reviews I read prior to purchase. Very little wind drag when doing head checks and in gusty cross winds. Vents well, shield is easy to operate and stays where you put it. I was gifted an HJC when I first bought the bike. While a nice helmet (for the price), and you can't complain too much about a free helmet, the interior is not as nice as the Arai, and more important, it didn't fit my head at all. Wind drag on this helmet was bad as the helmet was like a fish bowl on my head. Bell RS-1. Still breaking it in, seems a bit smaller than their sizing chart indicated. Other than being a tad tight on my beluga whale hump forehead, and leaving an imprint there for a few minutes after removal I like it... Light weight and looks killer, but I can't seem to be able to keep the fog-free shield clean, always seems foggy, lol. I thought about trying their auto-photo-darkening shield, but they're half the price of what I paid for the lid. $239 on sale from competition accessories. HJC R-pha 10 black metal, It is lightweight, comfortable, good quality and not very expensive. I'm wearing a Scopion EXO-500 Oil Yellow. Air Fit (it's has an air pump that tightens around the cheaks to quiet it and create a snug fit. Air crack-leaver on the side to crack the visor to let air in.. great when stuck in traffic..
ECE certified!! I bought becuase our local tracks will allow ECE or Snell. I love this thing! radio, full support for my iphone, I can play music make calls and with Siri listen and reply to incoming txt messages.. talking on the phone is a breeze the military grade windcut is amazing! you can be riding along the freeway doing 80mph take an incoming call and the person isn't even aware your on a motorbike, sounds like the old cell phones at that speed.. you can understand everythng but it sounds analog not digital (crisp). Shoei GT Air. Love the internal visor. Does not circulate much air on the top of the head though. Vemar Carbon Fiber VSR. Have owned two. Love how super light they are. The posts on the visors break easy though. Very nice 1-2 punch task!! You win IMO. Just got a new Arai Vector last week. I've worn a 3XL Arai for as long as I can remember but the sales guy at The Service Pavillion in Ephrata measured my head and got me the correct size and shape. A 1X! I thought he was crazy when he told me I was wearing the wrong size. Noise, buffeting, wobble, bobble, all gone now. $450 well spent. Last edited by sheldonsl; 06-26-2013 at 02:54 PM. What bike ya ridin these days sheldon? My brother's loving every minute on the Hawk and I'm still on my 1985 Sabre. I think I ordered a new rear shock for the Sabre from Jamie Daugherty, but I haven't heard from him in a bit, so I'm not sure if I did or not. I'll be in Oley Saturday for the annual Triumph Come Home Rally but the weather will determine how I get there. Ditto. HJC has always fit my head well and have generally used Sy-Max helmets in the past but loving the new R-pha helmet. It feels so light and peripheral vision is great! I've riden an HJC CL-16 for the past few years on street and track...cheap basic $120 helmet, nothing special...very noisy, decent airflow and venting. At high speeds it really catches the wind and bounces your head around. I've had it 3-4 years and just ordered new visor bases, one broke and now it won't stay closed fully. I shortly owned an AGV Rossi model XR-2, it was much more comfortable than the HJC, WAAAAYYY quieter and MUCH less wind movement than the HJC. 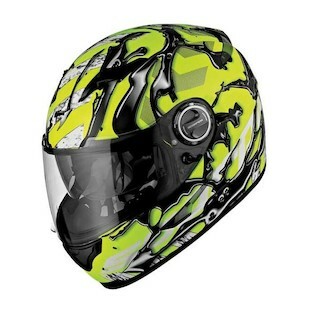 Soon I may be getting a new HJC RPHA-10, seems like a good lid, more geared towards racing and track riding. Shoei RF1000. This week a new one will come in, the RF1100 since I get 55% off, what the hell, I'm due for a new one. Pros and cons. The 1000 has removable parts that may be replaced, example, rear airwing. The 1100, rear wing is molded in the helmet. I knew this would get someone's attention. This deal comes from the Canadian Shoei importer, and, it last for about two or three days. My sales rep always informs me of this extra deal. Since my usual discount is only 30% off, when it comes around at 55, it's Worth it. Since the GT Air is their new model, it's not part of this deal. Wolverine, if you make it to Montréal, I'll get you a deal, but not other Wise. Hmmm, lets see, Pen-Mtl, is about 6-7hrs....not bad. Shoei RF-1100, The best purchase I have made since the day I bought my hawk. great air flow, cuts really well through the wind, comfortable and light weight, cant ask for more. I also have a HJC CL-16 worst $130 I have ever spent, visor sticks open and closed, pulled the mounting screws for it out the 2nd week I owned it and had to have the helmet replaced. No air flow, and does not cut through the air at all, I honestly thing for aero dynamics I would rather strap a piece of cardboard to my head. So Shoei all the way! 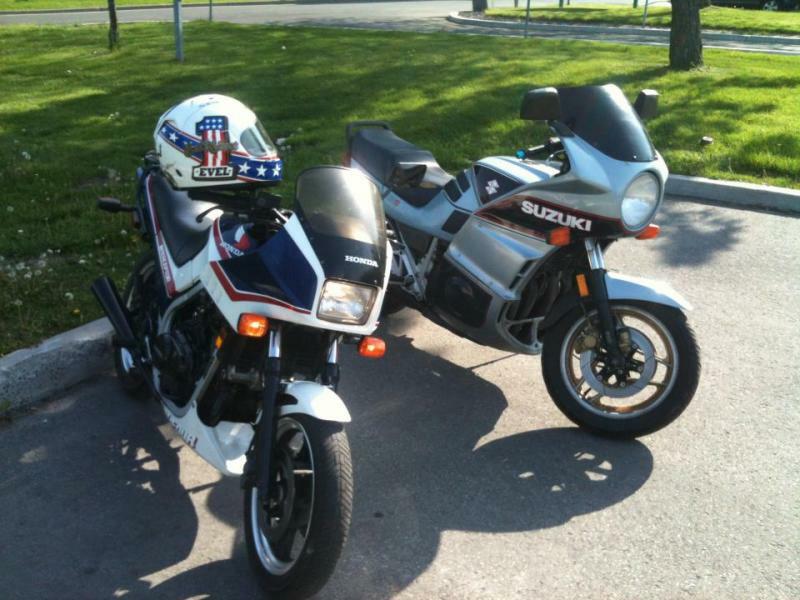 First one I had was a G-Max GM68S....after I read the reviews on web bike world, I figured it couldn't hurt. Flows a TON of air, (if you wanted two helmets, save this one for July) but gets foggy when its cold out. REALLY foggy. Also pretty noisy. And, when looking left or right, the wind catches it sharply, blowing your head back. But, it has a VERY nice 'odd' feature of a blinking red light on the backside to keep the cagers far back...and it works, believe it or not! Currently using a Bell Star now...Great helmet, finish way better than the Gmax, but fits tight like others have said. Quick release shield is a breeze, can change out one handed at a stoplight after some practice. Also, when turning side to side it cuts right through the air and doesn't whip your head back like the Gmax. Fog is not near as bad as the Gmax, but it also doesn't flow near as much air. (hows that??) And lately I've been noticing a weird squeaky noise coming from all over the helmet? Maybe it just needs a good cleaning and lube...we'll see. Last edited by Bandit400man; 07-25-2013 at 09:29 AM.